That's a good enough reason to buy it for many people. I can totally see the point of it...it's a completely different looking car to the rest of the 991 range. 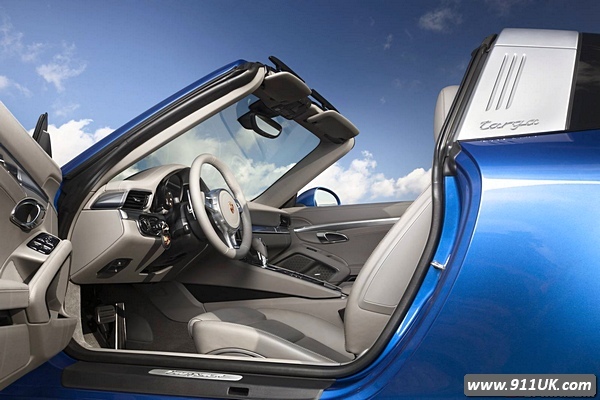 Especially with the roof down and that clamshell rear window harking back to the days of the 964 Targa and beyond. Few cars look like it on the road. I am smitten by it. Planning an end-of-year order in classic Targa orange. Still not getting it. Need to see in the metal. I like it, I like everything it stands for but I wouldn't buy one. I'd much rather a 997 Targa to be honest or a straight rag top. For me, it's like buying a car in a colour you know looks good but it's not a safe colour and it stands out a bit. I am smitten by it. It looks so right and loving the roof mechanism…very cool! Could this one day replace my p&j? The looks of the new Targa is unique harking back to the original Targa, although I will say I like the 996/997 over the old 964 but the looks of this new one are bang on and I would go for one at some point. The thing I don't like is the internal space, I can get a full set of wheels in mine, I doubt this will be as good an all rounder. Love it! The 993 onwards targa with the panoramic glass roof was a great innovation and I do like them, but the return to the black roof panel, thick aluminium roll hoop and c-pillarless glass rear of old is just magic. I suppose paying £8k extra (over the equivalent Coupe price) for those looks isn't too bad. It must be all about the looks though as the list price of a full Cabriolet is only about £650 more. Sadly I can't imagine the Targa being discounted for a while so I wonder how long it will be before it will seem 'very expensive' compared to the actual cost of a Coupe or Cab'. Although I was expecting a 'modern' design of the classic Targa roll over hoop, keeping with the theme of a modern 911. I can see Porsche shifting quite a few of these. It's a very pretty car, I can see it appealing to many, particularly those that didn't necessarily see themselves in a 911. Not sure I like the silver section down the middle of the car. They should have kept it a neutral color. Does it not look too feminine? It almost reminds me of a girl's hair band or (whatever you call those things) that they wear on their heads to keep their hair back.